Ingenico reveals a market-beating PIN-Pad solution for retail. Covering every possible payment method including contactless and mobile phone (NFC), it offers true convenience for shoppers. Boasting secure transactions, extensive communication technologies and a plug-and-play installation, this compact retail PIN-Pad is an unmatched, innovative solution, speeding up transactions and answering customers" needs across the board. 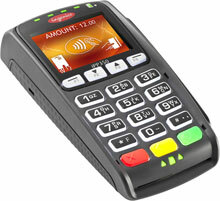 Pin Pad, Color Display, PCI 3.X device, Contactless, EMV, NFC enabled. Power supply and cables sold separately. Requires key injection in order to accept debit or credit card payments. Please call for more information. Pin Pad, Color Display, PCI 3.X device, Non-Contactless, EMV, NFC enabled. Power supply and cables sold separately. Requires key injection in order to accept debit or credit card payments. Please call for more information.